CJ, TJ, JK and JL Jeep models are well-known for superb on-road and off-road performance. Then why do they ship with mediocre headlights? Who knows, but now you swap them out for one of a multitude of high-quality, drop-in, Jeep Wrangler LED full headlight replacement kits now on the market. 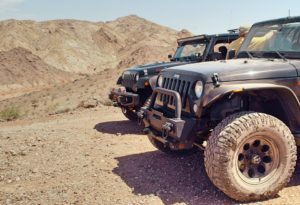 The best-of-the-bunch of these kits are reviewed here with all the details to make the choice that is right for you and your Jeep. Our best-of-the-best, the top-rated J.W. Speaker 8700 J2 Series headlights kit will far outshine and outperform your OEM lights and the LED competition. 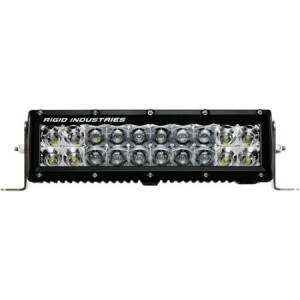 When looking for the brightest, highest-quality LED headlights for nearly any Jeep Wrangler or Wrangler Unlimited model for on- or off-road use, the J.W. Speaker 8700 J2 Kit wins hands-down in our reviews. These high-performance, DOT-approved, 7-inch round drop-in headlight replacements offer special Dual Burn® optics plus ComfortLite® technology that provide brighter lights with extra reach and wider visibility. They eliminate dark spots and fuzzy edge beams so you can clearly see the road ahead. This kit replaces Jeep headlights years 2007 and up with plug-and-play versatility. Do not worry about being street legal as the fact they are DOT compliant is etched into each light’s lens. These were designed for easy user installation and are compatible with CAN bus technology, so there is no need for an anti-flicker harness. The J2 LED headlight series does not stop there either. 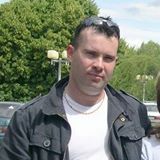 Add J.W. Speaker’s matching smoky turn signals and carbon fiber fog lights for a totally tricked-out appearance on your Jeep. These J.W. Speaker 8700 J2 LED headlight s are simply the best off road lights for any Jeep Wrangler pr Jeep Unlimited from 2007 on up. Their advanced high and low beam optics plus high lumens output compared to OEM headlights plus their ease of installation make these an easy choice for vastly improving road visibility and vehicle visibility on the darkest, rainiest nights. Your Jeep will be the talk of the street with these rotating halo Jeep headlight replacements from SUNPIE. The color changing halos for Jeep Wrangler owners offer a unique, eye-catching look. Choose from 200 color/movement modes directly from your Android phone or the included Bluetooth remote control. 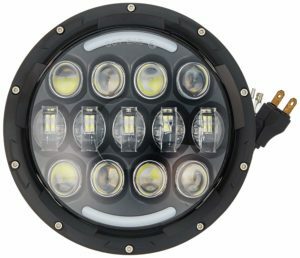 Compared to your Jeep stock headlights, the 40W, 30,000-hour Cree LEDs shining with 3600 raw lumens each plus advanced high/low beam optics, outperform standard OEM headlights by 400 percent. Plus the LED halo ring adds highly noticeable DRLs during the daytime. Everything is included in the kit for quick installation them to your vehicle including LED ballast, built-in CAN bus compatibility, H4 to H13 adapters plus a Bluetooth controller unit. They are DOT, SAE and E-Mark approved for on-road use. Our reviews reveal the SUNPIE Halo LED headlights to be the best headlights for Jeep Wrangler enthusiasts. They offer a dazzling fashion statement coupled with high-performance for clearer, brighter visibility in the gloomiest conditions. Typical installation is under an hour. At less than $140, they also offer superb value. 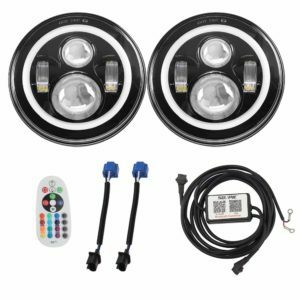 The LX-Light combo Jeep headlight and fog light replacement kit, part number LX-RHLFL746, also offers outstanding value with both high-performance 7-inch LED headlights and high-intensity 4-inch LED fog lights. On high beam, all four LED lights work together to produce a dark-shattering 12,200 raw lumens of bright white beam that reaches every corner of the road ahead. 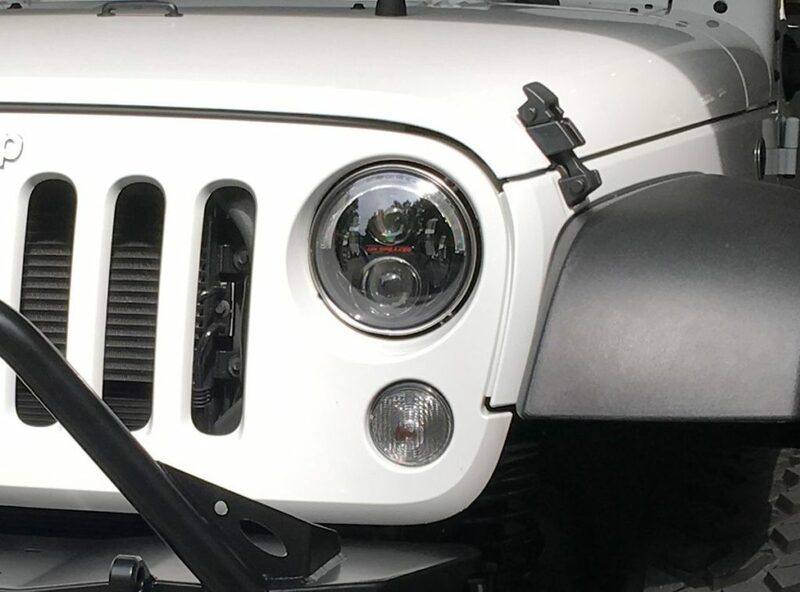 At under $130, you can see why buyers flock to these as the best replacement headlights for Jeep Wrangler aficionados who also have a need for low-mounted fog lights in the bumper. They fit any 1997-2017 Wrangler JK, TJ or LJ model. 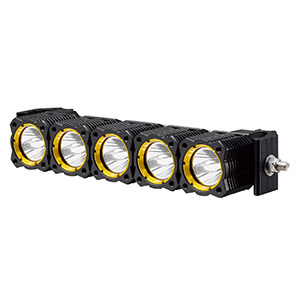 All four lights feature 50,000-hour Cree LEDs inside rugged, waterproof IP67 aluminum housings, H4 to H13 plug-and-play headlight adapters, H16 fog light adapters and a built-in EMC anti-flicker function that eliminates the need for an extra decoder. 2013-2017 Jeep Wrangler Hard Rock and Rubicon X models, due to special bumper design, may need custom mounting brackets for installing the 4-inch fog lights. For a full frontal LED upgrade for your Jeep’s headlights and fog lights, this LX-LIGHT package gives you excellent value at a budget price. You will experience a dramatic increase in road visibility under all weather conditions while enjoying the longevity and power efficiency of LED lighting. Nearly every model of Jeep from 1997 through 2017 will benefit from these flicker-free SUNPIE LED Halo headlight replacements. 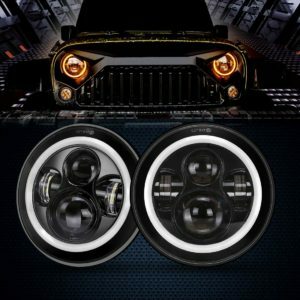 Our own research and reviews from buyers confirm that these are the best Jeep Wrangler LED headlights that also offer built-in DRL and amber turn signal functions provided by the conspicuous halo angel eye LED ring. Normally, the halo is white during daytime driving, but flashes amber when using your turn signals. Each LED headlamp features four 10W, high-intensity, 30,000-hour Cree LEDs for a total of 80W/40W high beam/low beam output. Their waterproof, dustproof and shockproof housings are IP67-rated to withstand dust, rain, mist, snow and ice. Total raw lumens output is an impressive 14400lm on high beams. The kit comes with everything needed for quick, plug-and-play installation including online photo-illustrated instructions. H4 to H13 adapters and an LED Can bus adapter are also included. If flicker does occur, you probably need this alternate LED CAN bus adapter. These are one of the best Jeep Wrangler headlight upgrades that also includes DRL and turn signal capability. These budget-priced SUNPIE 7-inch LED replacement headlights, model number 4333011022, will brighten the road ahead while making your Jeep Wrangler more visible to others during daytime hours. You might also check out the SUNPIE four-light kit with fog lights for additional road brightness in adverse weather. 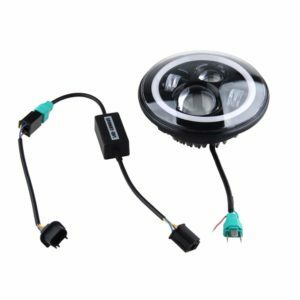 This Partsam LED Jeep Daymaker headlight replacement with halo ring is an especially strong contender in terms of performance and price in our research and that is before we point out that there are also a pair of outstanding fog lights included in the kit to fit your Jeep bumper cutouts. 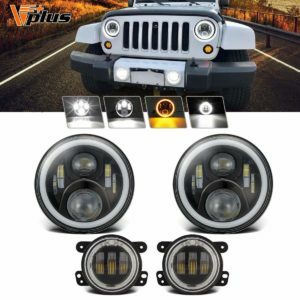 Compatible with Jeep models from 1997 to 2017, this Jeep Wrangler angel eyes, headlamps and fog lamps combo kit provides much higher beam strength in the darkest conditions compared to the OEM HID or halogen lights. Combined, with all four lights turned on, you get 17200 of raw lumens power to light your way ahead. Additionally, the built-in halo angel rings add highly noticeable white DRLs plus amber turn signals. The technology and build quality in this kit is impressive. A built-in EMC function eliminates flickers, the aluminum housing is waterproof and dustproof, a ventilation breather eliminates condensation and shatterproof polycarbonate covers protect the LEDs. Besides the regular H4 to H13 pigtails, special adapters accommodate connections for older Jeeps with 9007 or 9008 headlights. There is also an extension wire to aid connection of the turn signals and DRL function. Compare this Jeep LED headlights review to other four-light headlamp/fog light kit reviews here and we think you will see this is a standout product. With very high output, superior features such as the ventilation breather, 9007/9008 adapters and built-in beam angle adjuster, its performance and ease of installation are a cut above the rest. It is priced right as well at under $140. 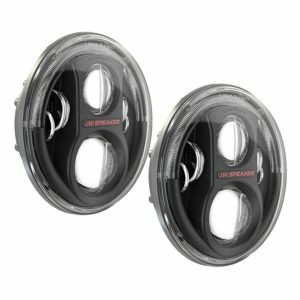 Among the best Jeep Wrangler LED headlight kits that include DRLs and turn signals, these SUP-LIGHT 7-inch 130W Jeep replacement LED headlamps caught our reviewers’ eyes due to several unique features including their 105W of light output for the pair. This high-value kit employs 13 powerful 50,000-hour Osram LEDs in a three-row pattern in each lamp. The middle row supplies the low beam, which in combination with the other rows produces a cranny-filling, long-reach high beam. A separate upper/lower pair of curved LED bars provide the DRL and amber turn signal capabilities. Together you have available 11000lm from the lamp pair on high beam with 7200lm on low beams. The rugged aluminum housing is stylishly complemented with a black bezel that offers IP67 protection from the elements, a strong optically transparent PMMA+ABS lens plus generously ribbed heat-dissipating ribs. There are also re-breathers on each lamp. The built-in EMC function means no anti-flicker harness is required. H4 to H13 adapters are included for improved compatibility. This SUP-LIGHT Jeep LED headlight replacement kit is the most powerful and brightest in our best Jeep Wrangler headlights reviews. 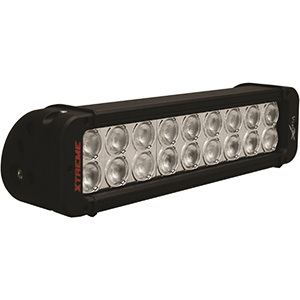 Their 13-LED design provides redundancy, deep, level beam reach with excellent foreground illumination for maneuvering on the darkest back roads even in hard rain. They are an outstanding value at just under $100. 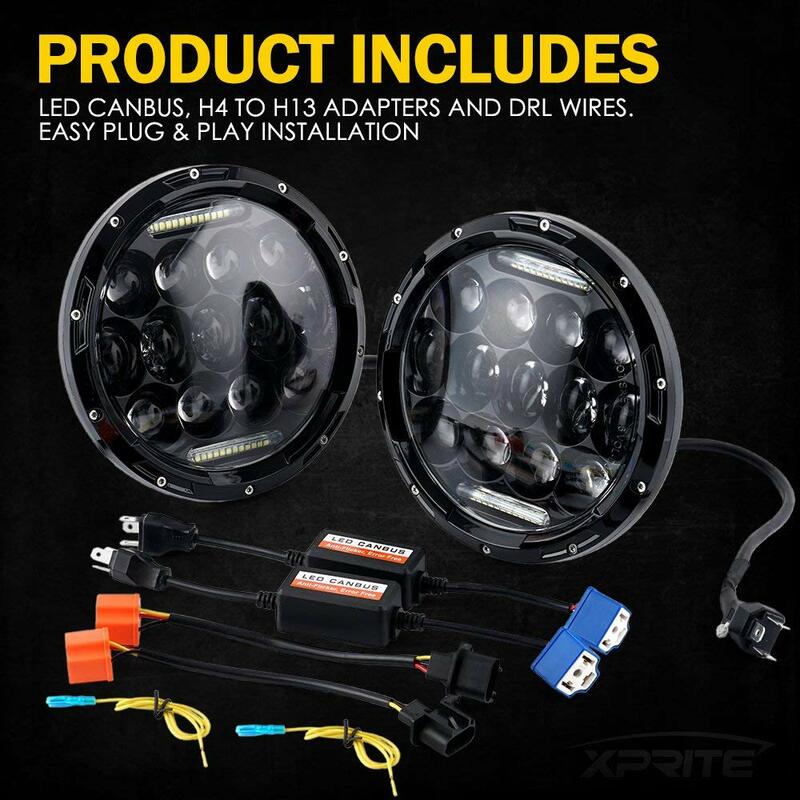 This popular Xprite LED Jeep headlamps kit offers the best Jeep Wrangler halo headlights for Jeep Wrangler JK, TJ and LJ models from 1997 through 2018. 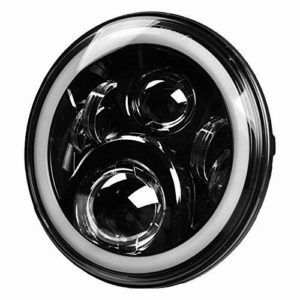 They feature 9600 raw lumens high beams and 7200lm low beams plus DRLs and amber turn signals via the stylish halo angel eyes ring on each light. Compared to Jeep OEM halogen or HID headlights, these are significantly brighter with superb forward reach for those challenging drives on moonless, bad weather nights. They feature four projection lens in each light that mold the beam to the road ahead to eliminate dark spots and illuminate road edges clearly. They boast a rugged die-cast, deeply ribbed aluminum housing that ensures the 50,000 Cree LEDs run cool to meet their rated lifespan. The shatterproof polycarbonate lens also contributes to these lights’ IP67 rating against moisture, ice and dust so you can enjoy their extra luminosity on- and off-road. They feature plug-and-play design, which means installation usually takes under an hour. 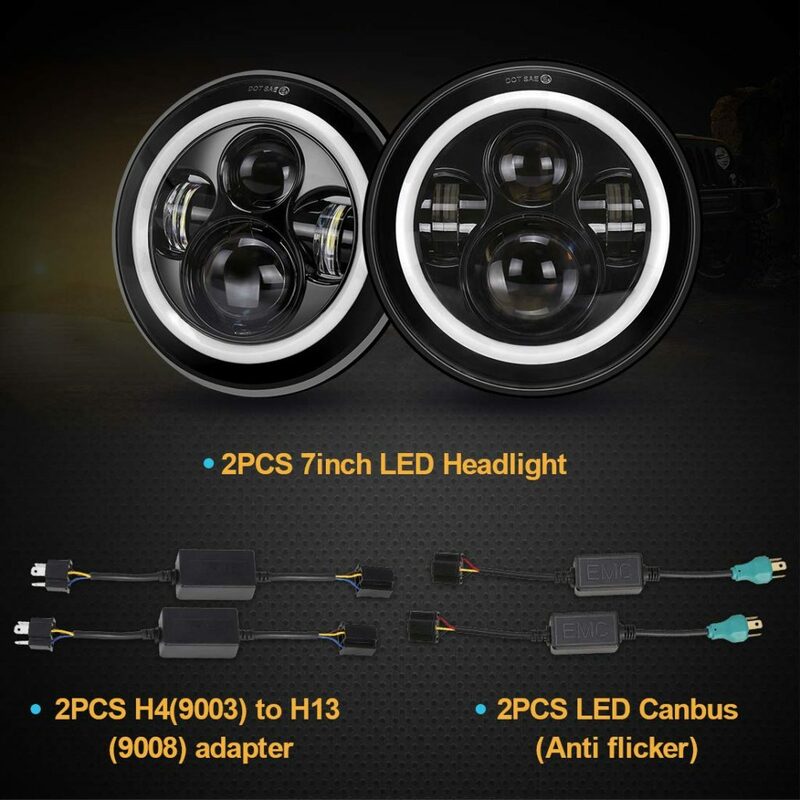 They come with H4 to H13 adapters, LED ballasts, LED CAN bus adapters and generously long DRL/turn signal pigtails with plugs. Instructions are sparse, but there are lots of details in online comments. 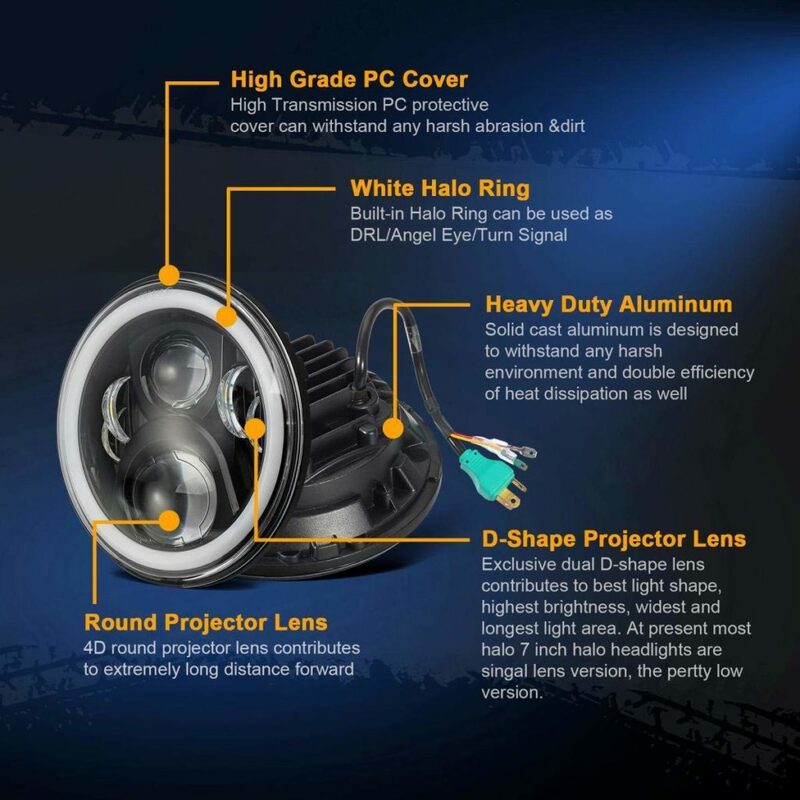 This Xprite LED Jeep headlamp replacement kit with halo angel eyes for DRLs/turn signals is a crowd pleaser thanks to its rugged design, build quality, high-intensity Cree LEDs and dark-splitting projected beams. Owner installation is aided by a complete wiring harness and adapters. Ditch the OEM lamps for these to gain impressive visibility on- and off-road. 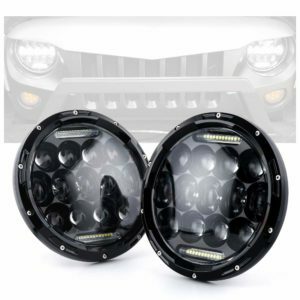 Jeep Wrangler halo projector headlights, such as these SUPAREE 7-inch LED Jeep headlight replacements, are an economical path to improving road visibility and improving your Jeep’s visibility to other drivers without blinding oncoming drivers. Their 7200 raw lumens output on high beams is about three times as bright as stock Jeep headlights. The kit features optically clear anti-scratch lenses and durable IP67-rated waterproof aluminum housings with deep, cross-hatch, heat dissipation-optimized cooling ribs and an internal fan for long LED life. The D-shaped and 4D-round high-transparency projector lenses mean extreme beam distance without blinding oncoming drivers. DRLs and highly visible turn signals are provided by the eye-catching dual-color halo ring. The SUPAREE kit fits a wide range of Wrangler JK, TJ, CJ and LJ models from 1997-2004 and H1-H3 Hummers from years 1992 to 2009. Normal DIY prowess is all that is needed to install these drop-in replacements for stock Jeep 7-inch round headlights in under an hour. H4 to H13 plug adapters plus LED CAN bus inline cables are included in the kit to simplify hookup and eliminate any flicker or headlight warning lights on the dash. 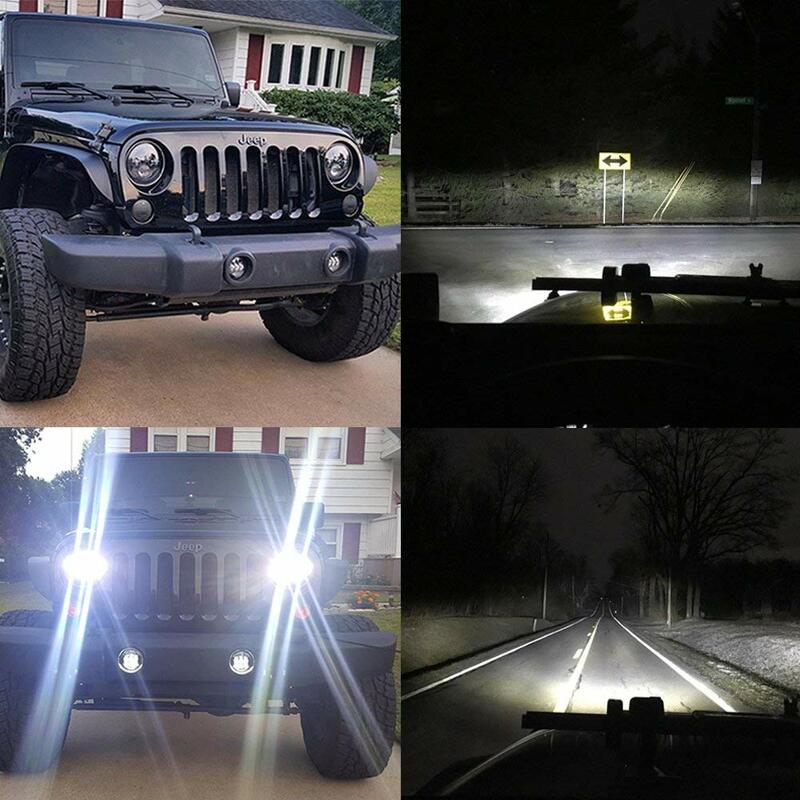 Want to convert your Jeep headlights to something brighter and snazzier without busting your wallet? These under-$100 LED halo ring SUPAREE lights may be just the ticket. While not the brightest in our reviews, they substantially increase road visibility with stylish flair from the built-in DRLs and circular turn signals. 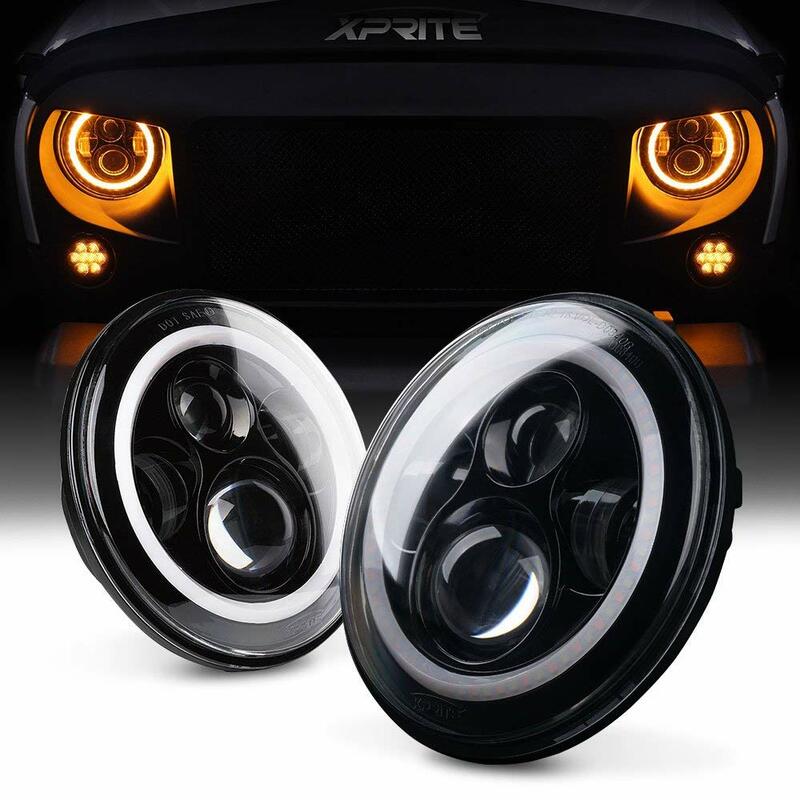 If Xprite’s other reviewed LED headlight’s halo angel eyes look are not for you, these Xprite best jeep headlights offer clean Euro-styling with 13 high-quality Cree 50,000-hour LEDs each in a three row pattern. 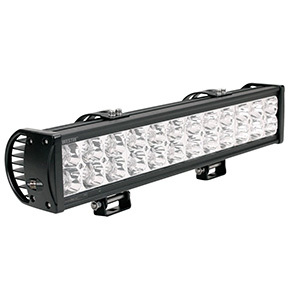 Three modes of lighting are available: high beams, low beams and DRLs supplied by top and bottom bright LED bars. The pair of headlamps are rated at 150W input with total luminosity of 10920 raw lumens on high beam. Each LED has its own lens, which results in a finely-tuned, level beam with outstanding foreground fill on low beams and long reach on high beams without blinding oncoming traffic. The lamps are protected by an all-weather design in durable, die-cast aluminum housings with deep cooling ribs. The lenses and lamps are protected by a high-transparency polycarbonate lens. The total unit has earned an IP67 rating against moisture, dust and ice, so they are ready for all your on- and off-road adventures. These fit most models of Jeep Wrangler from 1997-2018 and many Hummers from 1992-2009. The installation kit includes H4 to H13 adapters, LED ballast and LED CAN bus adapters. 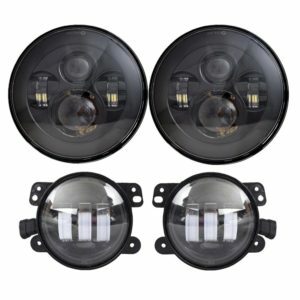 Jeep Wrangler smoked headlights are trendy now and this kit, at under $100, offers both style and high performance. They do not have built-in turn signals, but that makes wiring easier. Buyers love the increase in brightness and the spot-like reach of these excellent LED replacement headlights. 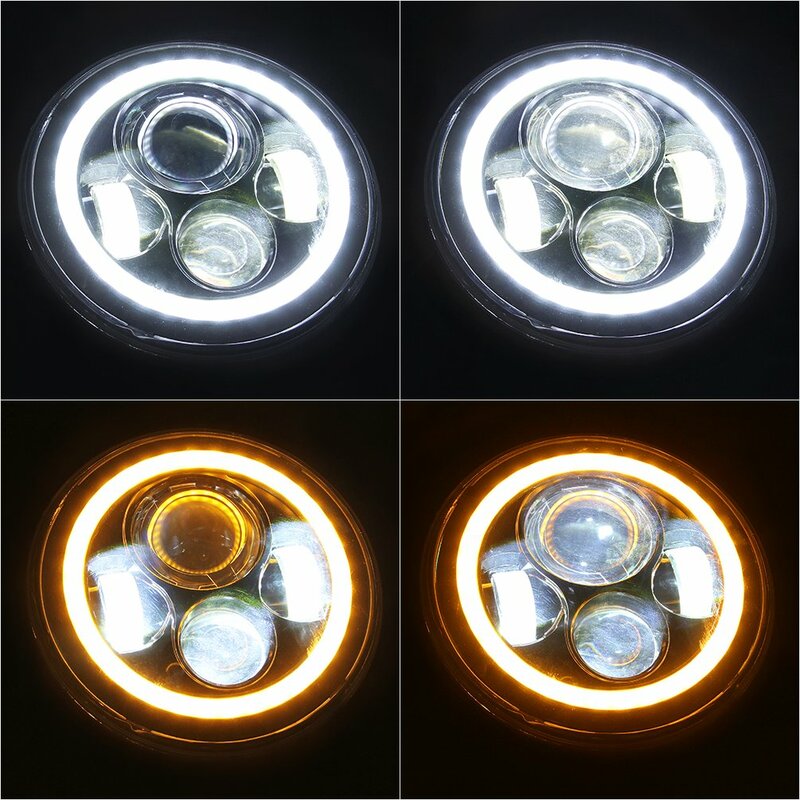 If you think your Jeep headlights should make a fashion statement, then these Omotor Jeep LED headlight replacements are the best Jeep LED headlights you can buy under $100. The RGB halo angel eye ring offers DRLs with a choice of 15 million colors! The DRL pattern is chosen via the supplied remote control or an app for your Android phone. Four high-intensity, 10W, 50,000-hour Cree LEDs in each headlamp provide up to 3600 total raw lumens on high beams and 2700lm on low beams. They feature a 5D projector lens design that keeps the road ahead well-illuminated without bothering the oncoming drivers on low beams. The gloom-splitting beams reach deep with great foreground and side fill. They are definitely superior to the OEM HID or halogen headlights that came with your vehicle. Long-life with continued high performance is ensured by the use of a high-impact aluminum housing and PMMA lens that produce a respectable IP67 rating against dust and moisture. Two H4/H13 adapters, LED ballast, DRL pigtails and a remote control for DRL RGB color selection are included. 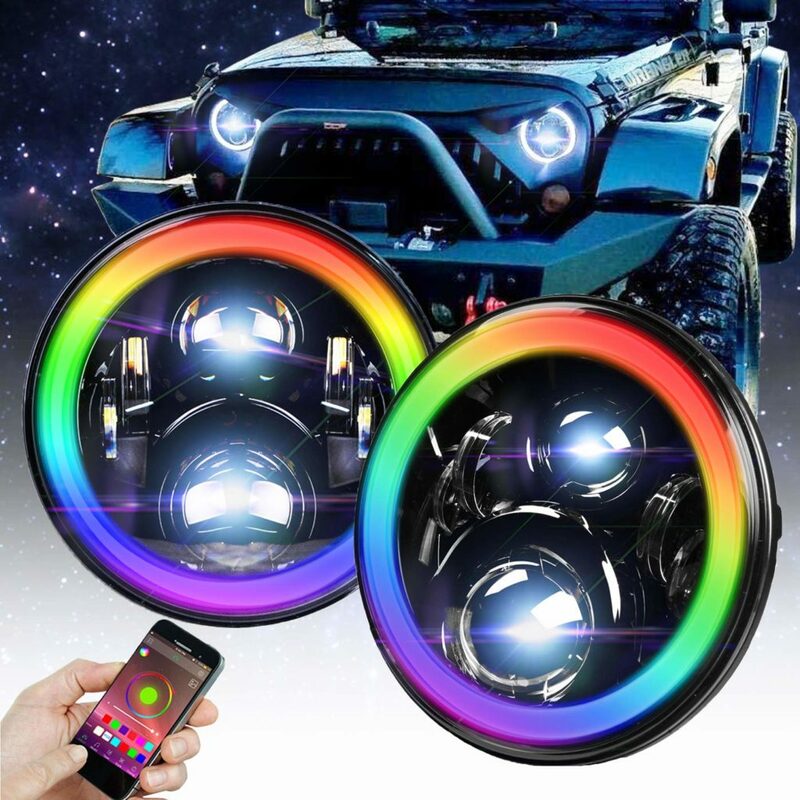 At under $100, these are a great value as LED replacements for your Jeep or Hummer OEM headlights plus you get those bodacious RGB halos to impress other drivers. Using a four-LED projector lens design, these lights will improve road visibility substantially on both high and low beams while providing longevity thanks to rugged materials and build. Identify the limits of your budget. Jeep LED headlight replacement kits range from under $100 up to several hundred dollars. There is a rough correlation between price, capability and quality, but do not assume the cheapest is the worst. You can also limit selection by the style of the light. For instance, do you prefer the halo ring angel eyes look or the cool euro-style of individual LED rows, understated DRLs and smoky covers? All the Jeep LED headlight kits reviewed here come with high-performance Cree or Osram LEDs, which have a reputation for quality and long life. If a kit description does not mention the LED brand, be concerned. The products reviewed here have a wide fitment range. That is, they are designed to drop into a most models and model years of Jeeps and in some cases Hummers or Land Rovers that have 7-inch round OEM headlights. However, double-check with the seller to make sure they fit your Jeep or only require minor modification to work. Especially for those LED headlight kits with multi-color LEDs, check with your local state transportation agency to ensure they will be legal to use on-road. You could wire them so that you can turn off the halo rings or use them only in white mode as DRLs. Finally, thoroughly research reviews for your short list of Jeep LED headlamp replacement kits. There will always be a few with bad experiences, but you want to focus on the detailed comments that often supply installation or operating tips and those with pictures showing the look and beam pattern. Check not only that the headlights themselves are listed as fitting your particular Jeep model and year, but also that the wiring components are a match for your vehicle. Most models use H4 aka 9003 or H13 aka 9008 connectors, but older or non-Jeep vehicles might have different connectors. If the kit includes an H4 to H13 adapter, then in 90 percent of cases you will be fine. Consider how many LEDs are in the kits on your short list. More LEDs might make you think there is more chance of failure but on the other hand they offer a higher redundancy factor. In other words, your headlights would lose 13 percent brightness in a 13-LED lamp if you lost two lamps, whereas a 4-LED lamp that loses a single LED is 25 percent dimmer. Light flicker is not common, especially if the kit contains EMC-mode built in or an anti-flicker wiring harness. However, some models and years of Jeep seem more prone to it than others, so check with the manufacturer to see if your Jeep light kit might flicker and whether they offer an alternate anti-flicker component. Environmental conditions where you drive should also be under consideration. If your area often has bad weather that diminishes driving visibility, you want to purchase the highest output LED headlights you can. Furthermore, if there is fog or you want to add extra beam punch on the darkest of driving conditions, think about getting a Jeep LED headlight kit that includes fog lights. One more factor that is important to think about ahead of time is how you are going to aim your LED headlights. Some, like the Partsam LED Jeep Daymaker headlight replacement kit come with built-in angle adjusters. 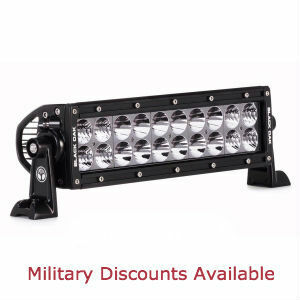 Others rely on the beam adjustment built-in to your Jeep’s current headlight housing. This factor is especially important if your Jeep is lifted. What are the main advantages of replacing my stock Jeep headlights? Increased brightness, less power draw and added lamp longevity are the main reasons to choose LED headlight replacements for your Jeep. Additionally, most produce foreground-filling beams on low beams and superior beam depth on high beams compared to OEM headlights. 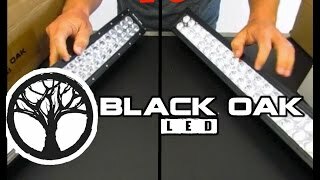 What are the best LED brands to look for? Both Osram and Cree LED companies were early developers of LED lighting of all kinds. You should expect their lamps to last from 30,000 to 50,000 hours or three to five years in typical usage. What is a CAN bus and do I need an adapter for my LED kit? CAN Bus is an automotive standard developed in the 1980s and first used in 1991 by Mercedes. Most modern OBD-II equipped vehicles use at least some parts of the CAN Bus standard. If you see a “Headlights Out” warning when unplugging a headlight, your Jeep has CAN Bus and may need an adapter for compatibility, which most Jeep LED headlight kit sellers supply. 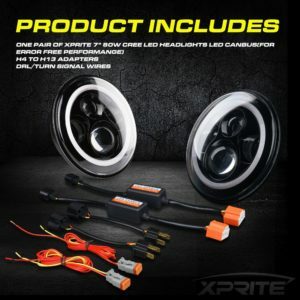 Will these kits fit my Jeep Liberty? Probably not without major modifications. Instead, consider installing LED headlight bulbs that replace your HID or halogen OEM bulbs such as the LASFIT H13/9008 LED Headlight Kit. After reading this guide, you are miles ahead of most shoppers seeking superior LED headlight replacement kits for a Jeep CJ, TJ, JK or JL model. All the most important features and points to note are right here. 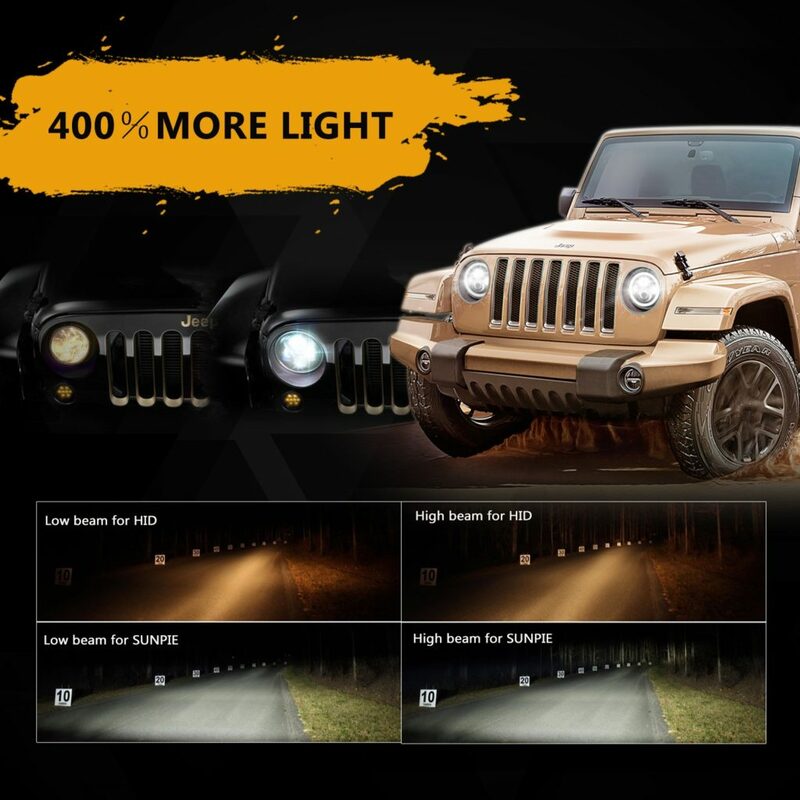 Now is the time to pull the trigger to equip your beloved Jeep with the brightest, longest-lived and most durable solution for increased road visibility and, in the case of DRL-equipped kits, improved visibility of your vehicle to other drivers. You will have noticed that this guide links to Amazon-listed products and for good reason. They are the leaders in selection, service and pricing. They also have generous return policies and efficient return processes so if you are not happy with your initial purchase, they set things right quickly. So, wait no longer. Your new lights are just a few mouse clicks away.